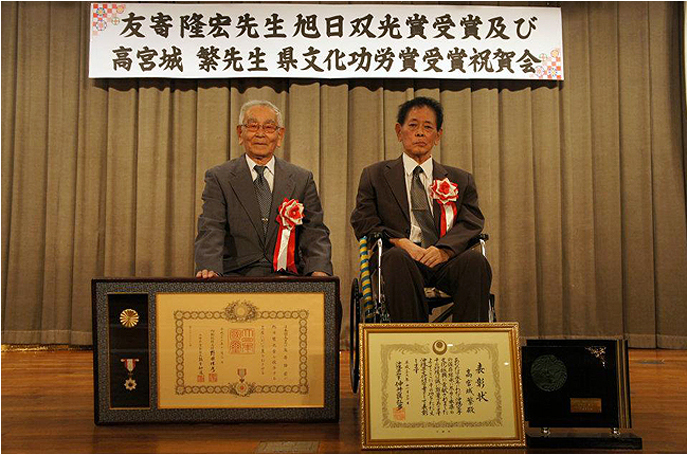 At 25th Feb. 2012, celebration party was held to honor Master Tomoyose Ryuko for receiving "THE ORDER OF RISING SUN" (gold medal with silver rays) and Master Takamiyagi Shigeru for being pronounced as the "THE PERSON OF CULTURAL MERIT" in Okinawa prefecture. Around 190 people gathered to show respect and love to these two great KARATE Masters. The contribution that Sensei Tomoyose Ryuko and Sensei Takamiyagi Shigeru had in spreading and development of KARATE in world was extraordinary. Thus it goes well beyond the style of karate that they practice (UECHI-RYU). To prove that fact, Masters Morio Higaonna (GOJU-RYU), Zenpo Shimabukuro and Kiyuna Choko (SHORIN-RYU), Shinzato Katsukiho (MATSUBAYASHI-RYU), were present among the other well known KARATE Masters. We hope that Masters Tomoyose Ryuko and Takamiyagi Shigeru will live long and continue to spread the his positive energy and knowledge and continue to be great inspiration of thousands and thousands of Karatekas around the globe. 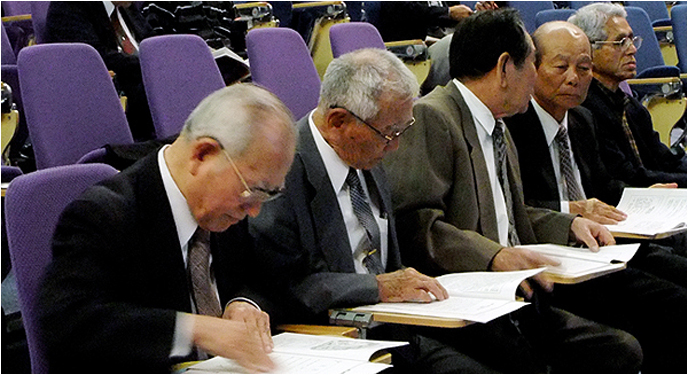 On the 11th April 2010 (Sunday), Okikukai Annual Meeting was held from 6:00 PM, at the hall "Sowa" in Okinawa City. After the greeting speech of President Mr. Asato Nobuhide, members entered the discussion on 2009 fiscal year measures. Discussion was considering, achievement reports, statement of accounts, auditing reports on fiscal year of 2009. The plans and budget for 2010, were presented and unanimously approved by all members of association. After the Annual Meeting, celebration party was opened with speech by new elected president Mr. Nakahodo Tsutomu, after which Honorary President Mr. Tomoyose proposed the toast. During the dinner, after speech of Okikukai Advisor Mr. TAKAMIYAGI Shigeru, his retenation of post of chief director of The Society For The Promotion of Traditional Karate-Do, was officially announced by the president Mr. NAKAMA Hirokazu. New elected Vice-President Mr. Yamashiro sent the message that "OKIKUKAI is gathered based on friendship, so we should all get on in friendly spirit", while Mr. Arakaki expressed his wish "to work hard with everybody’s support." An Advisor Mr. Yonamine Kosuke (Hanshi 9 Dan), closed the party with words of appreciation to former board of executive and the President Mr. Asato, as well as the words of hope for up-and-coming officials. Okinawa, a birthplace of the art of karate, was, on 28th March 2010, a venue for a symposium on karate, which can be considered as historic, as it was the first time that this noble martial art was debated about at the academic level. The symposium host was the 'MEIO' University in City of Nago, which, from April this year, will, from private ownership, be taken over by the state. Lectures at the symposium were delivered by: Eemeritus prof. Mr. Takamiyagi Shigeru, Hanshi 10 Dan (OKIKUKAI); Mr. Konayashi Takayuki, culturologist and socio-anthropologist (SHOTOKAN); Mr. Nohara Koei, master of sport arts of the "VASEDA" University (SHORIN-RYU); Emeritus prof. Mr. Nakamura Kan, socio-psychologist, and Emeritus prof. Mr. Shinyato Katsuhiko (MATSUBAYASHI). — The Building of Personality by Practicing Okinawa Karate. The symposium was attended by some 150 officials among whom were: Senaha Eiki PhD, the Dean of the "MEIO" University, Tomoyose Ryuko, Hanshi 10 Dan, declared as "National heritage of Okinawa", Inada Hiroshi, Hanshi 10 Dan; Nakahodo Tsutomu, Hanshi 10 Dan; and Yonamine Kosuke, Hanshi 9 Dan. The symposium was followed by an official dinner party which was complemented by ENBUKAI of the specificities of the UECHI-RYU system performed by members of the OKIKUKAI CHATAN DOJO, AGEDA DOJO and Mr Yamasaki Vukelic Hisashi Mihailo, a member of the OKIKUKAI SERBIA HOMBU (attending master studies at the "MEIO" University). This recent symposium is the evidence of a high-level development of OKINAWA KARATE-DO in both practical and theoretical aspects.